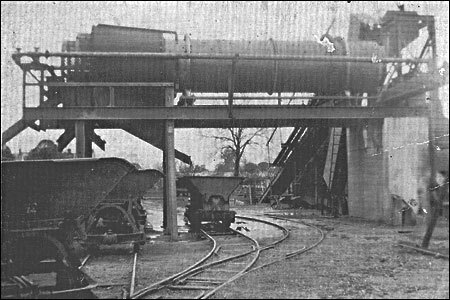 c1920 view of the washer at the pits. All the gravel was taken to the washer to be cleaned. 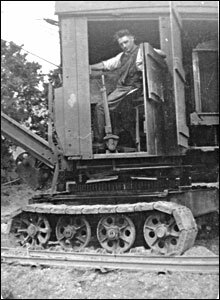 After the Second World War two local builders established the Cosgrove Sand & Gravel Co. Ltd., which bought the Cosgrove Lodge Estate from C. R. Whiting for £24,000 (and some other land at Castlethorpe), from which they extracted minerals for several years. They also operated a haulage and plant hire business. In 1958 the company secured planning permission to quarry an additional 21a. at Cosgrove. 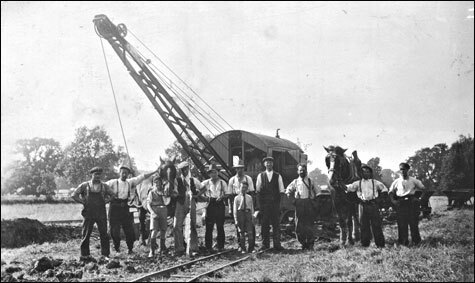 This consent was later taken over by Dowsett Mineral Recovery Ltd., who (as Dowsett Engineering Construction Ltd.) did not proceed with the workings on the Northamptonshire side of the Ouse, although they did quarry sand and gravel for the M1 just inside Buckinghamshire, using a washery in Northamptonshire. Cosgrove Sand & Gravel was voluntarily wound up in 1960-2; midway through the process the company sought consent to build a country club with swimming, sailing and other facilities at Cosgrove. This was granted, since the high water-table made the land unsuitable for agriculture, but in the event the company sold the estate and the new owners developed the property on similar lines. 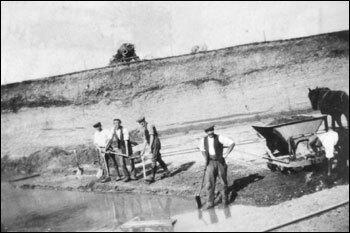 The Washing machine from Reg Whitings Gravel Pits, Cosgrove, c. 1936, showing the tubs pulled by horses for fetching and distributing washed gravel and sand. 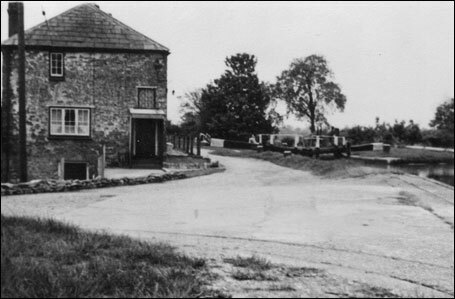 This was before the days of Dowsetts who supplied materials for the building of the M1 - completed in 1960 - which emptied these pits of gravel. All the photos are from the works before the M1 was started. Before they started on the M1 a lot of the sand and gravel went out on the boats  you can still see the tracks of the rails where the trucks brought it to the boats at the wharf by the lock. When they did take the gravel out on lorries we boys used to hitch a tow on their bikes  we would grab the bar at the back of the lorries  you had to be careful because this bar, across the back, was to open the gravel chute. We would put their feet up on the tyre rack and enjoy the ride. That old Bridge stood up to some battering. I remember a tank going over it during the War (Second World War), but I reckon it was lost. There used to be a 5 ton limit sign on the Bridge, but that got taken down. Once the M1 began two more mobile washers were brought in because the old washers couldn’t cope with the extra gravel. In the end there was one gravel lorry going over the Bridge every three minutes  a dreadful racket. There were two companies  Hall’s and Dowsett’s. 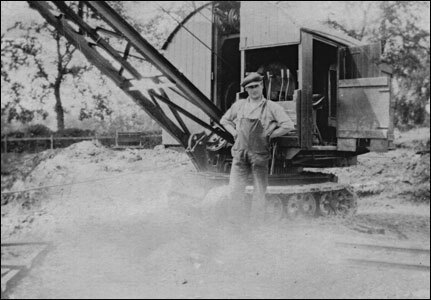 Charles Hill standing by the Ruston Bucyrus dragline he used to excavate the gravel. Ted Pittam worked at the pits until his retirement. 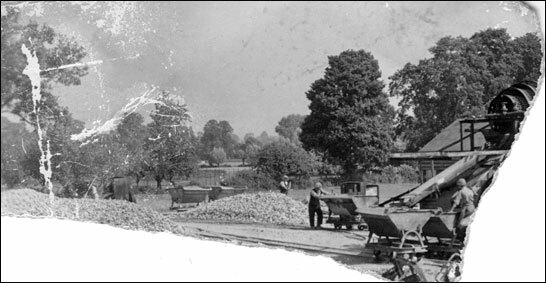 Albert and Cyril Pittam also worked at Cosgrove gravel pits. 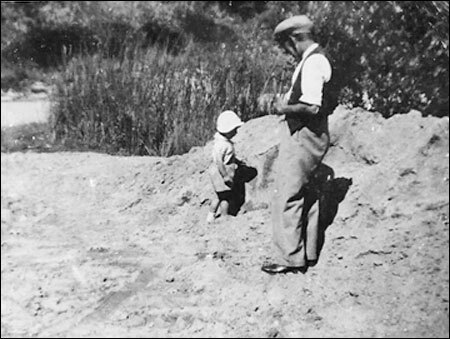 John Meakins and his father playing at the Sand and Gravel pits in the 1950s. 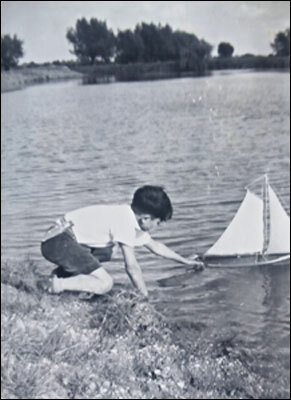 By 1952 water activities were common at the new lakes in the pits. 12 May 1951. Resolution to turn Co. into a public co.
7 July 1951. Annual return. 8000 shares issued and fully paid. Same four directors (Ethell, Betts, Nicholls and Fawson). Shareholdings unchanged. 29 May 1951. Dividend of 5% recommended. Balance sheet, Net profit £521. Creditors £2141. Assets, land at Castlethorpe £16000 purchase price, less £923 for stocks of extracted sand and gravel, leaves £15076. Plant and machinery £6824. Horses £233, Stock of sand and gravel £103, Debtors £2996. Bank £2184 cr. P&L: Sales £9004; GP £4617, plus £194 rets and £140 plant hire. 13 July 1951: Statement in lieu of prospectus. Cosgrove Lodge estate bought from C R Whiting for £24000. 19 March 1952. Further charge of £12000 on Cosgrove Lodge estate 109a. To John Edward Holdich Wartnaby, 31 Great Peter St, Westminster, solr and Ronald Agars Walker, Ightham Place, Sevenoaks, Kent, physician; Harold George Smith, 53 Archery Road Eltham, co dir. 19 March 1952. Memorandum of satisfaction that the legal charge of 1950 is paid off in full. FJ Fawson died 1952 and has not been replaced. 10 Nov 1952. Annual return, 11000 shared issued and fully paid. Balance sheet to 31.12.51. Shares now £11000, creditors £2414, bank £51 dr. Fixed assets £22002, debtors £3145. P&L: Sales £11775, GP £6071, plant hire £737, rents £105; after expenses loss of £700. Trading account includes directors fees of £1600. Three directors as before; all now directors of Laurence Turner & Co Ltd, as well as Betts & Faulkner. The additional 3000 shared taken by the four individual directors who now have 2500 or 2450 (Ethell) each. 31 Dec 1953. 11000 shares, three directors. £12000 is at 4.5%. Sinking fund of £1000 on dr side towards redeeming this. Sales £14120 plus £3800 from haulage; GP £8424, Plant hire £1035, rent £105. Net loss £3 after expenses. 1000 shares held by Betts & Faulkner have been transferred (250 each) to three directors and Mrs Fawson. Application by Cosgrove Sand and Gravel Co Ltd to build country club with swimming, sailing facilities at Cosgrove. Site comprises disused sand and gravel workings SE of village. Could not be economically used for agriculture because of high water table. Approved subject to highway etc conditions. Later sub-committee hears report from CPO that following sale of Cosgrove property by auction, application to convert to country club and lido had been withdrawn  awaiting proposals from new owner.